As you come out of Plaistow station, there are traffic lights and a crossing immediately in front of you. Cross the road and turn right. The road you are on is Plaistow Road. Walk straight and you will walk past a Travis Perkins building supplies store on your left. Continue walking straight towards a second set of traffic lights, which is about 20 metres ahead. Along the way, (as a reference point - on the other side of the road you will see Station Café. Continue walking straight to the second set of traffic lights (on the other side of the road you will see a pub called Victoria Tavern). Turn left at this corner, this road is called Clegg Street. Walk up Clegg Street – (the name of the road changes to Pelly Road). You will see a newsagent called SM Food & Wine along the way on your right and as you keep walking up the street, you will see the big signboard of TLC Dental on your right, this marks our location. 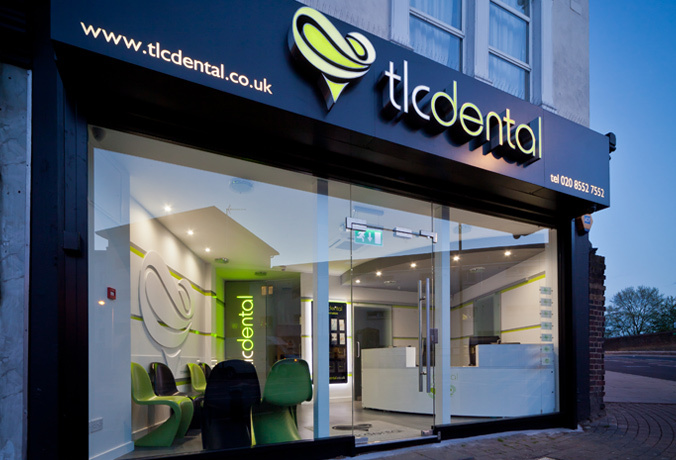 Our front entrance is located on the corner of Pelly Road and Terrace Road. Dentists in East London, Plaistow welcome new patients for dental treatments like oral health, restorative & cosmetic dentistry including dental implants.